MLNP: Rockin with Rock-it Scientists DJ Guzie @ MANIC!! Manic Mondays for November 16th is gonna be fire!! Special guest DJ Guzie brings the launch code for this mission critical night of Mayhem. 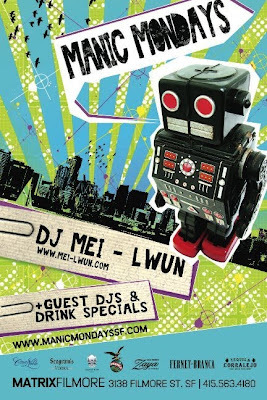 Resident and host DJ Mei-Lwun on hand to call out the countdown so get your moon boots kids this one will be out of this world. This coming week we will also be celebrating Rissa's B-Day so get ready to party hardy!! Always Free, Drink specials on Fernet and Corralejos, Dress to express and come with a smile and ready to dance.